Today I received a couple of new Secure Digital SD SDHC MMC to IDE 3.5 40 Pin Male Adapter Converter cards for my Roland VS-840 Multitrack Recorder. I installed the device and was able to successfully partition and initialize a 2GB Sandisk SD Memory card in the Roland VS-840. Partitions are 1GB. The VS-840 is now totally silent and I no longer get any “drive busy” errors when using the VS-640 in MT1/MT2 Song format. The installation was flawless and although there may be some future SD card compatibility issues, I have so far found most SD cards to work with the device. 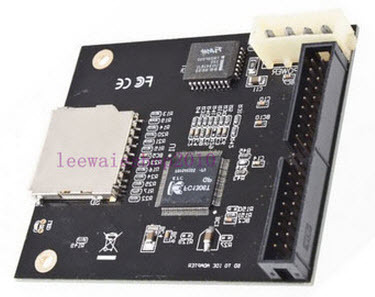 The person I bought the SD adapter converter card from on Ebay is http://myworld.ebay.com/leewaieshop2010/ . I attached a photo to this article of what the device looks like. Previously in another article I wrote I had purchased a couple of similar converters from an online shop called DealExtreme which had horrible service. I eventually got my money back and promised I would never do business with them again. The product I purchased above came from Hong Kong and it arrived actually in exactly one week from purchase. The service was great and I would definitely order again from this one individual. Replacing the Zip drive with an SD Card in the Roland VS-840 works beautifully and really cleans up some of the issues I had with the unit. I’ll probably try the same SD card converter with the Roland VS-1680 and Roland SP-808. It’s likely the SP-808 won’t work as I’ve yet to hear any success stories with SD cards working in an SP-808. SD Cards do however work very well with the Roland VS-840. I use my Roland VS-840 extensively to import WAV files into my Roland VS-1680. I export WAV files into the VS-840 format using the BR WAV converter software and then import that into the VS-1680. It works great. UPDATE #1 – The replacement of the Roland VS-840 250MB zip drive with an SD Card adapter is really working well. I am using a SandDisk Extreme III 2GB card that has a 1GB Fat16 partition. I did this on the computer using the free version of MiniTool Partition Wizard. I tested with the BR To WAV converter software and was successfully able to convert Wav files to and from the SD card. I was then able to drag and drop all tracks into Sonar which all played back perfectly and in sync. I swapped out the short IDE cable in the Roland VS-840 for a longer one. I had to use a needle to create a 40th hole in the cable as there are 40 pins on the connector side of the Roland VS-480. My cable only had 39 holes but it’s easy to puncture a hole to make it 40. I also had to wrap the SD card converter to ensure nothing touched the metal casing of the VS-840. These SD card converters MUST be shielded from the metal case properly to work 100%. I used plastic to wrap the SD card converter and it works beautifully. Finally I did some recordings in MT1 format that required some heavy reading from the SD card. I have yet to get a single “drive busy” error. Everything works perfectly and it’s all a 100% silent. I forget the unit is on sometimes…laugh. An SD Card Adapter is a definite “must” upgrade for the Roland VS-840. Highly recommended. UPDATE #2 – I installed this SD Card Adapter into the Roland SP-808EX and it unfortunately didn’t work. I was able to turn on the SP-808 and it gave me a message that the SD card needed to be formatted. I performed “Quick Format” but after that I couldn’t create a song or do any sampling. Instead I got a no disk space error. I got really close, but I don’t think it’s going to work with this particular SD card adapter. Zoom HD-16 Multitrack Recorder makes recording easy! Lately I’ve been tackling used Multitrack recorders that people have been practically giving away to used music shops here in Nagano-city, Japan. 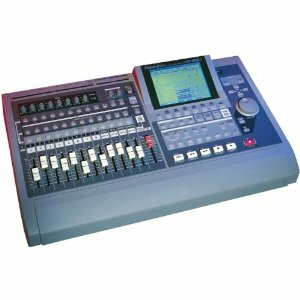 One such recorder that I really found is the Zoom HD-16 Multitrack recorder. It’s a very cool little unit that does just about everything I want with a multitrack recorder. One catch though and that is the Zoom HD-16 depends on a factory recovery CD to restore the Hard Drive should it go bad and need replacement. Luckily with the unit I picked up, the recovery CD was included along with the case and manual for the Zoom HD-16. I know Zoom doesn’t offer the HD-16 recovery CD for download on it’s website, nor do I know if it’s still available via mail. When doing research on the Zoom HD-16, I found the recovery CD impossible to find unless someone offered to create an ISO. I actually just did that after acquiring the Zoom HD-16 and have a backup of the Recovery CD in ISO format. 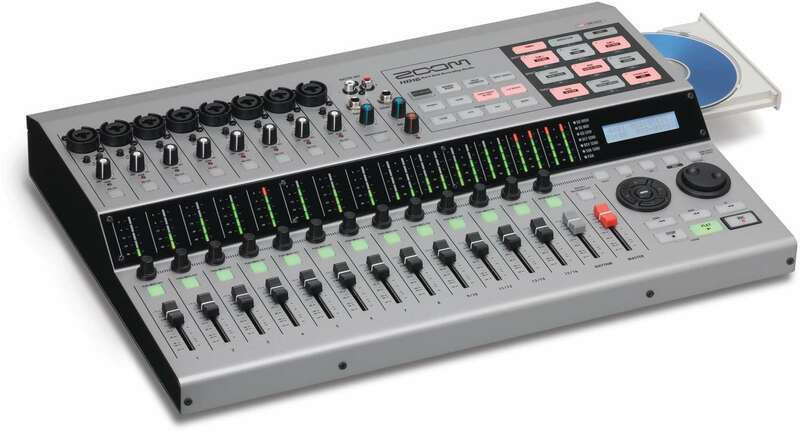 The Zoom HD-16 is a fabulous Multitrack recorder that comes with full midi specs that syncs perfectly with other devices like a drum machine. The Zoom HD-16 MUST be the master, but that works out pretty well for me. The HD-16 also has a built in drum and bass machine. The bass sounds can be changed when using a special software editor which is available somewhere on the internet but I can’t remember where. ( I’ll update shortly with the location ). The drum machine can also load up custom samples that you import via USB connection. You can then use the pads to create patterns for playback guidance and recording. In addition, you can use recorded tracks to create seamless phrase loops which can then be exported into your DAW of choice. You can also import WAV files and sequence them on the Zoom HD-16 as well. Overall, the Zoom HD-16 sounds great and is very easy to use. I really like the effects and the ability to transfer WAVs to and from the Zoom HD-16 with ease. I’ve read you can replace the Hard Drive with an SSD drive which I may do eventually. As it is now, there is practically no noise with the existing hard drive. The only achilles heel with the Zoom HD-16 is the fact that a factory made recovery CD is required to restore any storage device installed in the Zoom HD-16. You could of course swap out a working drive and create an image file, but you’d better do that before the Hard Drive crashes of course. I have also heard Zoom is pretty good about sending a replacement recovery CD, but as time goes by, it may become harder to acquire. I’ve made several ISO backups of the Recovery CD just in case anything happens. One of my main uses for the Zoom HD-16 is to record tracks such as guitar, vocals, and bass guitar using a guide track recorded from a synth or keyboard. I then sync the recording to a sequencer and then play over that with a lead synth. All of that can then be recorded live and burned using the built in CD from a master track. The overall sound is really good. Thus the Zoom HD-16 is a great way to add guitar, vocal, and percussion tracks to your synth setup. Midi sync is rock solid at least with my unit. The Zoom HD-16 can be found at a great price on the second hand market. The newer Zoom R24, R16, and R8 models have been released of which I also recently acquired the Zoom R8 for keyboard recording. I’ll talk about the Zoom R8 in a future article. Here is a great video showing the Zoom HD-16 in action with keyboards. My setup is very similar. Last weekend, Shimamura Music store in Nagano-city, Japan was offloading their remaining stock of Korg SOS SR-1 recorders at a rock bottom price, so I decided to pick one up. I have had my eye on one for a while and I didn’t think I would likely come across one on the used market so I bought one. I’m very glad I did, because this little device is a total homerun purchase for me for a number of reasons. First I MUST say that I have a “specific” need or use for the Korg SOS SR-1. That requirement is that I needed to be able to record a keyboard like the Yamaha DX-7 into the Korg SR-1 and seamless loops between two A and B points. From there I want to have all loops recorded into separate WAV files for easy export into either a DAW or a multi-track hardware recorder. In this regard, the Korg SR-1 works absolutely perfect and to my knowledge is the ONLY recorder that does this particular task. I’ll elaborate further below. 1. I plug the Yamaha DX-7 ( example synth ) into a Mackie Mixer and then the mixer into the 1/8 line in jack of the Korg SOS SR-1. 2. As a guide, I then browse through the many on board Drum patterns of the Korg SR-1 for recording a 8 to 16 bar loop. No problem there. 3. I set the Korg SR-1 to record the drum pattern for 16 bars as an example. On playback, the SR-1 sounds great and the drums are recorded “seamlessly” at the initial volume level. 4. Then I practice and record loops, overdubbing as much as I please ( unlimited overdub tracks ) over 16 bars with the Yamaha DX-7. ( Or with any other synth plugged into the mixer ). 5. When finished, I finalize my 16 bar pattern in mere seconds and pop out the microSD card for transfer to the computer. In Sonar for example, I am able to drag and drop all overdubs separated into individual tracks. Simply brilliant!!! I can also put the WAV files into the Boss RC-300, Roland VS-1680, Zoom R8 etc. 6. From there, I can mix and add anything I like to enhance the audio tracks “individually”! I can now delete tracks and do further editing if so desire as well. IMPORTANT!! Yes, I have to push the play or record button to overdub so the Korg SR-1 would likely NOT work well in a live situation. My purpose was to find the fastest way for me to overdub and record synthesizer or keyboard patterns and have them recorded into individual WAV files. I didn’t want to use the computer because I prefer to play my parts live on hardware synths and wanted to keep my hands on the keys as much as possible instead of a mouse. That’s just how I operate so I know others will prefer other methods. The Korg SOS SR-1 works very well at getting overdub loops between two A & B points into separate and “seamless” WAV files. It’s simply works fantastic. Are there any issues with the Korg SOS SR-1 that I’ve encountered so far? Well not really, BUT these are likely problems for many. 1. You cannot connect the Korg SOS SR-1 directly via USB to the computer. – This isn’t a problem for me and don’t mind using just the microSD. 2. The microSD is more difficult to use than a regular SD. – Perhaps, but again it’s a minor issue for the work that I do. 3. It’s difficult to read the screen and the batteries don’t last long. – Again double true. To combat this I bought an adapter and have memorized the menus I need to get my projects done. It’s an inconvenience, but not a major problem. I definitely would not use this as an “out in the field” recorder. I think at this time there are better options and the same or similar price point. For looping though it’s awesome!! 4. Is the Korg SOS SR-1 a good live looper? – I don’t think so. The Boss RC-50 and RC-300 are much better suited for that purpose AND they have midi. Where the Korg SSO excels at is recording individual loops and saving them into individual WAV files all in sync. You “could” use the SR-1 as a live looper, but frankly there are better options for “LIVE” use. 5. Is there anything else like the Korg SR-1 on the market today? – No! I haven’t seen anything that can record unlimited seamless loops, all in sync, and with only the push of a button which can then be all saved into individual WAV files. There’s nothing out there quite like the Korg SR-1. It’s really fun to be able to loop record keyboards like the Yamaha DX-7. This give you the ability to layer different sounds, patterns, and build up 80’s and 90’s sytle songs without the use of a sequencer or any programming. You can also pipe in effects or tryout the Korg SOS effects which aren’t too bad as well. Your audio data is then saved and you can import them into likely any DAW for later editing or song creating. The Korg SR-1 is simply brilliant as a loop sratch pad for ideas and song creation. It is quickly becoming my favorite piece of gear to record music. With the WAV files you can then insert right back into a Roland VS recorder, Zoom recorder, etc for later playback or in sync via midi. The two main keys are that the Korg SOS records into separate WAV files AND it allows you to record seamless AB loops VERY quickly with almost no setup in between takes. Ideas don’t stay long in my head. They need to get out quickly and the Korg SOS SR-1 allows me to record fast into a usable data format that can later be reused or modified for another piece of gear. 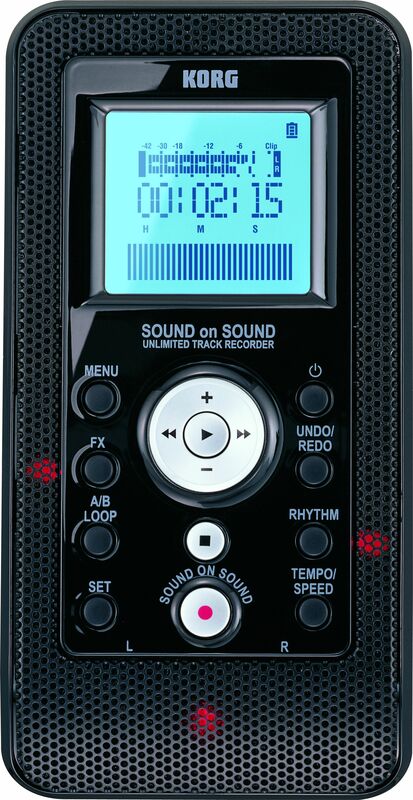 For my specific purposes, Korg hit a huge homerun with the Korg SOS SR-1 recorder.